/// UAV SLAM – Visual 3-D scan of the immediate vicinity. UAV-based Simultaneous Localization and Mapping (SLAM) is a method using a flying robot that maps its environment, simultaneously approximating its own position on that map. Based on this estimate, the aerial system can navigate over the terrain without GPS – indoors as well as outdoors. No matter whether it’s complex labyrinths for research purposes or real scenarios. Several sensors are used for the autonomous orientation. 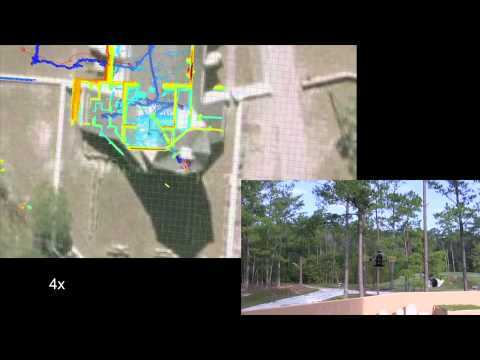 /// UAV SLAM – Robotics, stereo-based visual navigation & SLAM. Combine these options with intelligent automation solutions and intelligent solutions to adequately interpret the information. At the same time, use a series of useful sensors to collect a lot of revealing information. AscTec Research Line systems provide visual information. Visual research such as Visual Servoing and Control (robotics), stereo-based visual navigation and visual SLAM are based on it. All you need to do is upload your image processing and interpretation algorithms for detection and orientation to the onboard computer. Test your programs and synapses. You can switch to the safe standard mode at any time and take over manually in altitude or GPS mode, and land – for your next attempt.